Today, I have had the immense pleasure to visit the University of Pisa. 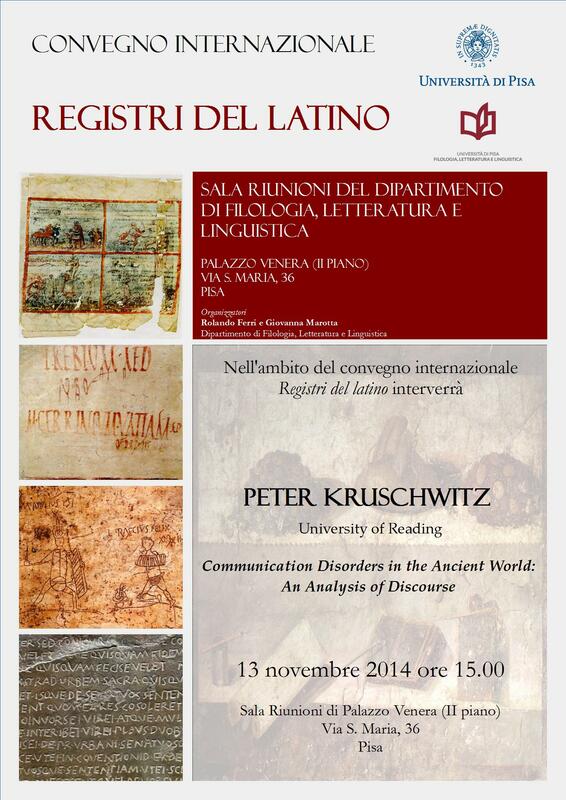 I was invited to talk about an aspect of my recent linguistic research, carried out in 2013 in collaboration with my brilliant undergraduate research assistant Abi Cousins, regarding the discourse about communication disorders in the ancient world. Did I give this talk in shameful disregard of my obligations to the British Academy, who stipulated that I must work on nothing but the Carmina Latina Epigraphica during my 2014-5 mid-career fellowship, you ask? Well, I’d never! My frame of mind and my sense of duty are way too Prussian as to even consider such appalling behaviour! So where do these two topics meet? Potentially, or so it would appear, they meet in Epidaurus, on the Peloponnese, of all places – not a particularly likely place to find Latin inscriptions to begin with, but that is a different matter altogether. Discovered in Epidaurus, by the famous temple of Asclepius, there is a votive inscription that exhibits the iconic shape of a tabula ansata (‘winged tablet’) cut into the stone. Votive Ears. – Image source: http://lapwing.files.wordpress.com/2008/03/votive-ears.jpg. Phoebigena, et posuit sanus ab auriculis. Offspring of Phoebus, and he put them up, healed, ear-wise. Unlike my spell checker suggested, Cutius Gallus’ problem was not a name-related ‘cute gall’ or any such bilious issues: according to the above inscription, it was an unknown disease that affected his ears – and it is for this reason that the (votive) ears take centre stage on the tablet (rather than the inscription itself): they are the actual gift to the healer, and the poem is a mere ornament. Temporary as it would appear to have been, Cutius Gallus’ infliction must have been relatively large-scale (either in terms of the pain that was caused or in terms of the effect it had on his hearing), as one would not normally make such a costly vow for what is but a minor ailment. Once he was healed, Cutius Gallus appears to have (re-)discovered his good humour, though: note how he refers to the monumental ears as aures, whereas his own, by contrast, are just little auriculae. So, what’s the connection to communication disorders then, you ask? 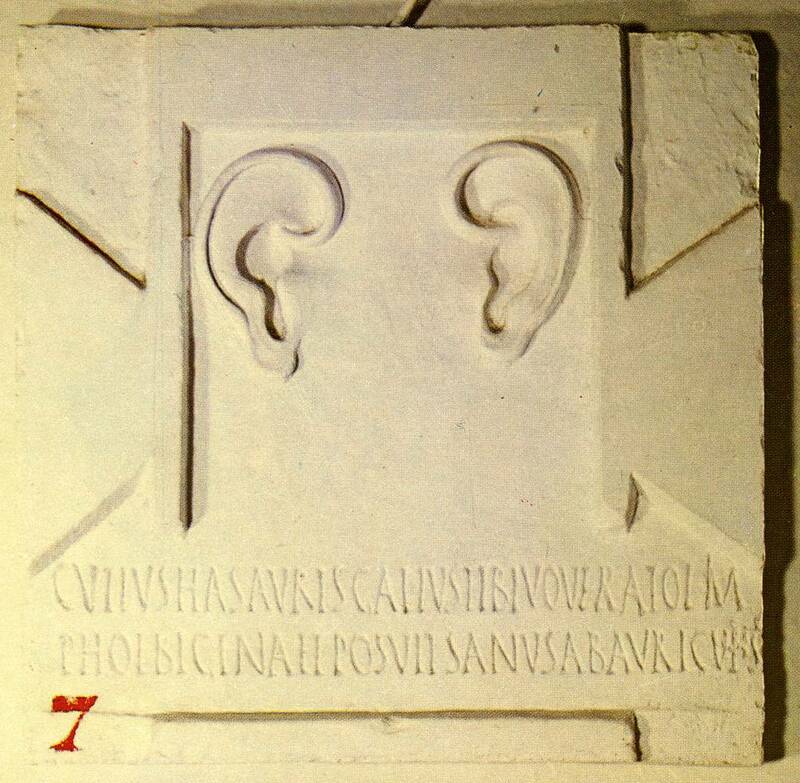 My question is this: if Cutius Gallus had a problem with his hearing, a problem so significant that this votive was in order, one must wonder, of course: how did he manage to communicate with his immediate environment – with his family, doctors, and religious personnel? Communication disorders – including, but not restricted to, stutters, stammers, or mute/deafness – seem easily noticeable in everyday scenarios through obvious disruptions to speech production. Yet, they are in fact rather complex phenomena, caused by a wide and diverse range of issues. Very obviously, hearing issues are one of many potential causes, as insufficient hearing, if not treated or counterbalanced by supporting aids, does not only make everyday communication difficult or impossible: it also, especially at a young age, may have an effect on one’s ability to speak, resulting in delayed or incomplete forms of language learning – an issue perfectly well known in ancient literature. εἷς γάρ μοι μοῦνος τυγχάνεις ἐὼν παῖς· τὸν γὰρ δὴ ἕτερον διεφθαρμένον τὴν ἀκοὴν οὐκ εἶναί μοι λογίζομαι. You happen to be my one and only child: the disabled one, as far as his hearing is concerned, I do not regard him as existing to me. But this example is not a modern one. And as usual, it is salutary not just to jump to conclusions and pull the discrimation card for the sake of it, when other societies, remote in time and space, are concerned: a closer look often reveals rather more complex scenarios. Without going into great detail about attitudes towards disabilities and disfigurement in the ancient world, it seems fair to say that, despite significant changes in attitude since then, one thing has not changed at all: the high value assigned to an unimpaired ability to communicate. Our progress, admirable and desirable, is largely the result of technical and medical advancements, not of a deep and fundamental change in attitude – based on our society’s ability and willingness to afford it – and, generally speaking, our (alleged) changes in attitude coincide with those technical advancements, rather than precede them. It is hard to overestimate the importance and the role that the human voice played in ancient civilisations such as Greece and Rome –societies that were fundamentally oral, reliant on power of the spoken word, to such a degree that rhetorical education became the cornerstone to upper-class education. Pliny the Elder, for example, in his Naturalis Historia writes that an individual’s voice constitutes a ‘large part’ of a human being’s external features (uox in homine magnam uoltus habet partem), as it is usually recognisable before any visual feature (Plin. nat. 11.271). This, in turn, would imply a notion of significant incompleteness in a person, when this key feature is damaged or absent altogether. These factors are of even higher significance, of course, for those who, like Croesus, aim to continue their rule through their offspring – after all, members of the ruling class with communication disorders have been subject to immense ridicule since ancient times. Whether delivered from pain, disorientation, or an actual inability to hear: Cutius Gallus must have been immensely relieved to have been cured, for it allowed him to participate actively again in a society in which unimpaired hearing and speaking, resulting in unimpaired communication, were of pivotal importance to anyone who hoped to make a difference. This entry was posted in Carmina Epigraphica, Epigraphy, Poetry and tagged Carmina Latina Epigraphica, Communication Disorders. Bookmark the permalink.